It is the lowest settlement of the village of Korakiana. This big village is today is divided in two: the upper village is called Ano Korakiana and the lower village is called Kato Korakiana and in the past it used to be called Katomeri, which means " the lower place " . A place of noblemen, it still has today some of its old mansions in quite a good condition, while the whole village offers you interesting moments . Its position near the sea and especially near the bay of Ipsos (a favorite place of landing for attacking armies and pirates) was responsible for its constant devastation , the most important of which being those perpetrated by the Turks in 1537 ( Barbarossa ) and in 1716. Besides the threat of the raids, the whole region suffered geological phenomena which resulted in important land slidings, some of which are accounted for by myths and legends and others by the recent history. Another geological phenomenon is also a tunnel ( Grava tou Menigou ), about which the locals will tell you that, according to experiments carried out a little before World War II (1938), it leads to an underground river which flows under the sea and into the coasts of Ambrakikos Bay , near Preveza. This is where lived and worked the Greek 19th century poet Gerasimos Markoras , while not far from here you will find the house of another significant Greek lyrical poet of the early 20th century, Lorentsos Mavillis . You should definitely visit the medieval castle of the Polylas family , today ‘ Mibelli Villa ’ , a unique building in a ’ forest of spruces, pine trees and other perennial trees. This castle welcomed celebrities from Europe, among whom the emperor of Austria Franz Josep, the emperor of Germany Keiser Willelm, the king of Italy, Vittorio Emmanuelle, the kings of Greece, George I and George II, who settled permanently here from 1936 till 1939. 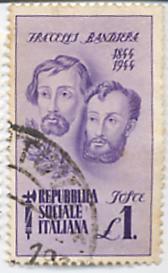 It is here that the Italian brothers Emilio and Attilio Bandiera were planning an attempted rebellion in South Italy; their effort didn't work out, due to betrayal (February - June 1844). A little outside the village, you can visit the old knight's medieval tower of Garoufas , where Dionyssios Solomos, the important National poet of Greece, used to come, to relax and write . Finally, you can enjoy the local warm spirit at the taverns and the coffee shops of the village or, of you're lucky, you can watch a cultural event . At the end of Korakiana village, right on the junction of the road Corfu-Palaiokastritsa and the road Corfu-Sidari to the north next to the bridge and hidden in the thick vegetation, there is a small villa, which Corfiots call " Giatrones ", meaning "belonging to the doctors" (1). 1) R. BARBIERA, I fratelli Bandiera, Genova, 1912, pp. 29-30; M. C. CHATZIJOANNOU, op. cit., p. 138; G. MONSAGRATI, op. cit., p. 18. 2) B. LAVAGNINI, op. cit., p. III. Su Solomòs cfr. anche G. CANNA, Dionisio Solomòs, Discorso inaugurale dell’Anno Accademico 1896-97, letto nella R. Università di Pavia, Pavia, 1896.